If you do not travel to Sweden before, and want to enjoy a luxury accommodation at sea in floating hotel, the island of Klädesholmen near west coast of Sweden is the best destination where you will find your dream , where there is near its coasts a hotel dates back to five years. This unique hotel was just an idea in the imagination of the two partners Susanna and Patrick who thought in a tourism project to attract the attention of the world to the west of Sweden, the idea back to 2004 and achieved during four years, in October 2008 opened the first floating hotel in Sweden called Salt & Sill, and from then it attracts hundreds of thousands of tourists. The Greek islands absent from the tourism interface for many years despite its magnificence and old fame , and also considered one of the most romantic and elegance places , despite the mystery that shrouded. To break this impression to large segment of tourists ,the Greek resort (Mystique) was created since a period on the Greek island (Santorini) ,and offers an unique atmosphere through its villas and suites scattered over an area of more than 2000 square meters (the area of this elegant resort )which enchants the tourist, is a mixture of natural beauty and high-end services that give visitors eventually lucidity. 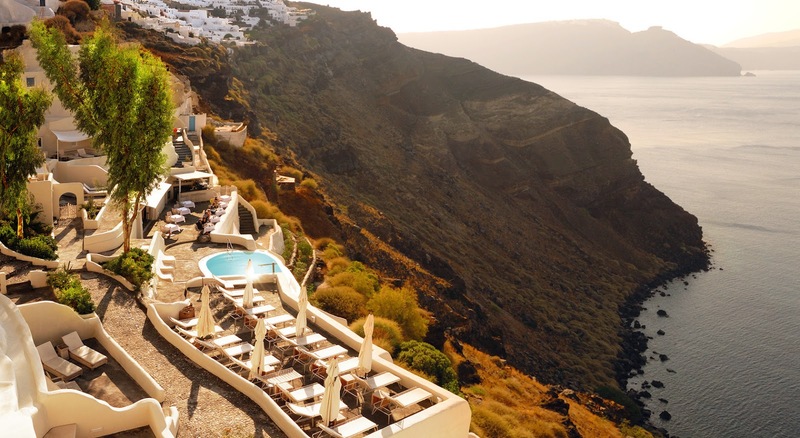 The resort is located on the top of Oia cliffs which were formed over many years ,is like a safe haven and high refuge for tourists to revitalizing their lives and their bodies in a superb view overlooking the Aegean sea crystal blue and surrounded by volcanic mountains ,such as the most famous volcano Caldera.